This recording brings together diverse music from many centuries. The texts of all the pieces express the suffering of the oppressed and the hope for peace, and the majority of them are taken from the Old Testament Book of Psalms. Stanford’s great late anthem For lo, I raise up was written within months of the outbreak of World War I. Using the words of the Old Testament prophet Habakkuk, Stanford expresses his horror at the violence and destruction of war, and at the centre of the work proclaims ‘We shall not die’, a message of defiance that leads to a hopeful conclusion. In the final phrase, however – ‘Let all the earth keep silence’ – the Lord is portrayed as judge of all, and the final bleak organ notes seem to portray something of the uncertainty of the last months of 1914 – with the destiny of so many held ‘in the balance’. The promise of peace is expressed in the Norwegian composer Knut Nystedt’s 1958 motet Peace I leave with you, which sets words of Christ from John’s Gospel – the only New Testament text on this recording. Nystedt’s use of strong tonal centres (first C sharp minor, then E flat major) grounds the work, ameliorating the effect of the strong dissonances, and creating a sense of security and comfort with the words ‘Let not your heart be troubled’. William Byrd’s My soul oppressed sets verses from a metrical version of Psalm 119; it was published in the collection Psalmes, Sonnets and Songs (1588). Byrd designates the 2nd voice (sung here by Altos) as the ‘first singing part’, suggesting that this five-part work originated as a setting for solo voice and four viols. This music was intended for performance at home, possibly as part of private domestic devotions. Behold, thou hast made my days by Orlando Gibbons was ‘made at the entreaty’ of Anthony Maxey in the week of his death in 1618. Maxey was a royal chaplain, and from 1612, Dean of Windsor, a position to which Gibbons, as organist of the Chapel Royal, would have been answerable. The work is an example of the ‘verse’ anthem, in which solos (‘verses’) alternate with choruses. In this recording, the five-part texture is realised by just eight singers, with two singers each on the highest part and on the two lowest parts, and single voices – high tenors – on the two ‘Contratenor’ parts: this performance practice reflects information found in surviving part books and contemporary descriptions of voice types, such as Charles Butler’s Principles of Music (1636). The use of a smaller, ‘consort’ choir in this work and in the psalm setting by Byrd reflects the special form of ‘consort’ evensong devised by Silas Wollston and promoted at Queens’ College during 2013-14. Much of the music of Thomas Tomkins harks back to the style of Tallis and Byrd, whose music he no doubt sang as a child. The anthem Turn unto the Lord our God, published in 1622, is one such ‘Tudor’ work: it opens tentatively with the unfolding of an exquisite web of six-part counterpoint, before a bolder musical figure emerges with a message of hope – that truth will endure ‘from generation to generation’ – repeated statements of which become ever more emphatic and confident. Both of the works by Mendelssohn on this recording were composed at the request of Englishmen. The Six Grand Sonatas for the Organ (1845) were commissioned by the publishers Coventry and Hollier, riding the wave of Mendelssohn’s popularity as an organist during his visits to Britain. His recitals included improvisations – famed for their variety and novelty – and performances of the works of J.S. Bach, and both elements are reflected in his organ sonatas. The majestic, confident opening of Sonata No.3 is followed by a double fugue in the minor mode – the first theme angular and supplicatory, the second theme flowing and impassioned – and at the combination of the two themes, the pedals bring in the great Lutheran hymn tune ‘Aus tiefer Not schrei ich zu dir’ (‘Out of the deep do I cry unto Thee’), a Bachian masterstroke that brings the fugue to its dramatic conclusion and a return of the music from the opening. Mendelssohn never performed his organ sonatas in England. At the time of his first visit in 1829, English organs reflected an insular tradition that differed greatly from organ building on the continent: they had a very heavy keyboard action and no full pedal board. However, the increased awareness and interest in the organ music of Bach generated by Mendelssohn through his organ recitals contributed to a rapid change in organ design and construction during the 1840s, as English organ builders took inspiration from the instruments of the German Baroque. The genesis of Mendelssohn’s great anthem Hear my prayer is closely bound up with this crucial moment in the history of English organ building. On 30 September 1840 in the City of London church of St Peter’s, Cornhill, Mendelssohn came to test a new German-style organ with full pedal board designed by his friend, the organist Henry Gauntlett, and built by William Hill. A unique record of this private event survives in the organ loft of the church to this day: it is a copy of the theme from Bach’s Passacaglia BWV582 in Mendelssohn’s hand, signed by Mendelssohn. The autograph hunter on this occasion was the church’s organist, 20-year-old Elizabeth Mounsey, a former child prodigy and one of the first organists in England (along with Gauntlett) to learn to play with pedals. The significance of this occasion to the creation of ‘Hear my prayer’ is that in addition to Gauntlett, Hill and Mounsey, a fourth auditor was present that day: the chemist, painter and librettist William Bartholomew. This was the occasion on which Bartholomew met Mendelssohn for the first time, since in a letter of 24 October 1841 he wrote: ‘do you remember the day of your performance on St. Peter’s Organ, Cornhill, writing a Canon in pencil for a lady, which was bathed with wine in the vestry to fix its traces? – this was done by me’. The first performance took place on 8 January 1845 in the medieval Great Hall of Crosby Hall. Built in 1466 by the wool merchant Sir John Crosby, this grand medieval palace in Bishopsgate had by the 19th century become a historic anomaly in the commercial heart of the City of London. Just three rooms of the original building remained in 1841 when restoration work was undertaken in preparation for a series of concerts organised by Ann Mounsey, a former pupil of Wesley and Attwood and the teacher and older sister of Elizabeth Mounsey. At the first performance of ‘Hear my prayer’, Ann Mounsey played the organ accompaniment on the new organ by Henry Cephas Lincoln, and the soprano solo was sung by Elizabeth Rainforth. The room in which this perfomance took place still survives: in 1910 it was relocated to Cheyne Walk in Chelsea, where it now forms part of the London house of Christopher Moran. The words Hear my prayer are equally familiar to modern audiences in Henry Purcell’s masterly eight-part setting, the text in this case taken from Psalm 102. Dating from around 1685, this piece appears to be the opening section of a larger work that Purcell did not complete: in the autograph manuscript, the elaborate flourish that usually marks the end of a piece is missing, and it is followed by a number of blank pages. Hide not thy face by Silas Wollston, composed in 2014 especially for this recording, is a companion piece to Purcell’s ‘Hear my prayer’ that continues with the text of Psalm 102 where Purcell left off. Initially Purcell’s idiom is adopted before the music breaks out stylistically as the entreaties of the supplicant become evermore desperate. In the central section of the work, the psalmist expresses a profound sense of isolation, symbolised by the pelican, the owl and the sparrow (most likely a blue thrush), solitary birds that still inhabit the deserts of the Middle East. The idea of writing a companion piece to a work by Purcell has a historical precedent in the works of Mendelssohn’s English contemporary, Samuel Sebastian Wesley. At the end of the score of Man that is born of a woman, composed in the mid-1840s, Wesley states that his piece is intended to precede Purcell’s Thou knowest Lord, the secrets of our hearts, an anthem of simple dignity that was composed in 1695 for the funeral of Queen Mary. While Wesley adopts many of the rhythmic and harmonic features of Purcell’s style, his own distinctive musical language is unmistakable, as at the phrase ‘never continueth in one stay’. Wesley was himself following the precedent of William Croft, who incorporated the same Purcell setting into his version of the burial service published in 1724. The pairing of Wesley and Purcell’s music found on this recording was performed in St George’s Chapel, Windsor, at the elaborate memorial service for Queen Victoria in 1902. Ave Maria, Ave Maris Stella is a prayer of supplication to the Virgin. The setting for organ by Jean Langlais is the first of three Paraphrases Grégoriennes composed in Paris between 1933 and 1934 when Langlais was studying organ improvisation with Charles Tournemire and composition with Paul Dukas. The music is built upon a plainsong melody and provides a showcase for the many colours of the Binns organ in Queens’ College chapel. Built in 1892, this organ is one of the finest instruments in Cambridge and has not suffered from attempts to ‘improve’ or enlarge it, as is the case for so many Victorian organs. The recording concludes with a setting of one of the best-known psalm texts, The Lord is my shepherd. Composed in 1975 to celebrate the 900th anniversary of Chichester Cathedral, the music by Lennox Berkeley has a directness and simplicity that belies its harmonic subtlety. A sense of confidence and security is created by the strong tonal centre (on G major) which casts into greater relief the dissonances that Berkeley uses to depict ‘the valley of the shadow of death’. As in Mendelssohn’s ‘Hear my prayer’, the division of text between soloist and chorus captures both the personal and the universal nature of the psalmist’s text. even he whose might is his God. O Lord my God, mine Holy One? though it tarry, wait for it, because it will surely come. for therein do I trust. be eased of my pain. Incline thine ear unto me. but of thee, O Lord, who for our sins justly art displeased? The Choir of Queens’ College is one of the leading mixed-voice choirs in Cambridge. It consists of around 24 singers, the majority of whom are undergraduate members of the college, and two organ scholars, all under the leadership of the Director of Music, Dr Silas Wollston. During the academic term, the choir sings at services three times a week in the college chapel, performing music from both Protestant and Catholic traditions. While twentieth-century music forms the core of the choir’s repertoire, the choir increasingly performs Baroque and contemporary music, reflecting the specialisms of the Director of Music. The choir is also regularly joined by a group of student instrumentalists, the Queens’ Chapel Players, enabling the liturgical performance of concerted music. Outside the academic term, the choir performs both nationally and internationally. In recent years the Choir has travelled to Hong Kong, New York, France, Germany, Switzerland, Italy and Belgium. 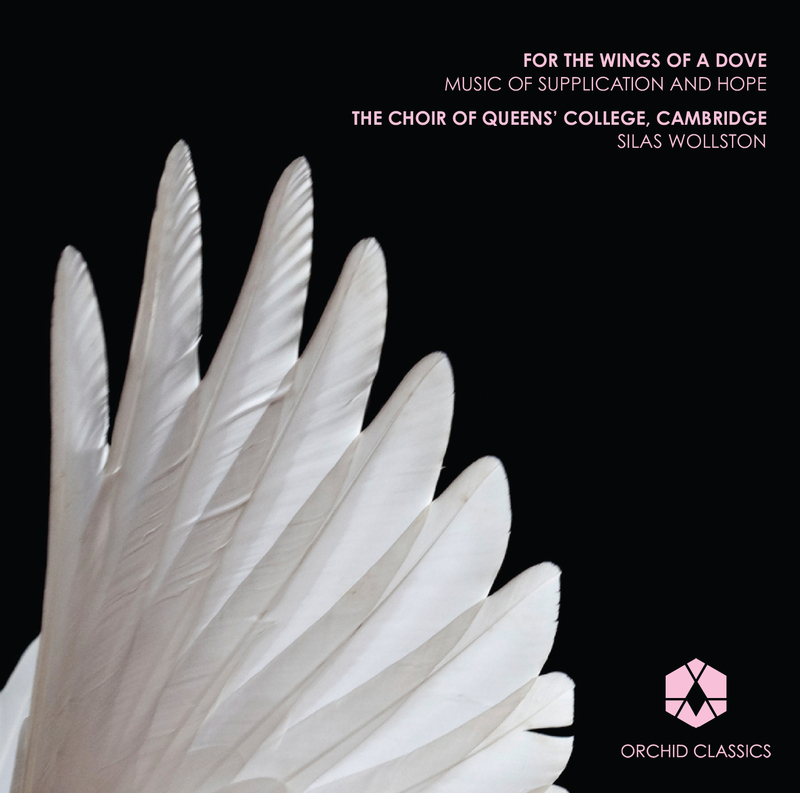 The Choir’s CD recordings, including And comes the Day (on Orchid Classics, ORC100027), Flight of Song, Songs of Heaven and Earth and Love and Honour, have attracted widespread critical acclaim. Silas Wollston is a versatile musician who has pursued a varied career as a performer, teacher, researcher and composer. As principal continuo player and assistant conductor for Sir John Eliot Gardiner from 1999–2010 he became closely associated with the Monteverdi Choir and the English Baroque Soloists, with whom he appeared as a soloist on numerous occasions, including the celebrated Bach Cantata Pilgrimage in 2000. From 1996 to 2004 he was the artistic director of the award-winning chamber ensemble The Private Music, which championed unusual seventeenth-century English repertoire: this became the subject of his PhD thesis (The Open University, 2010). In 2011 he was appointed Director of Music and Director of Studies in Music at Queens’ College, Cambridge, and in 2014 he was appointed an Affiliated Lecturer at the Faculty of Music. As a composer, his works have been performed and recorded by Fretwork.